Designed and manufactured for cutting Kevlar® and other high strength fibers. These materials, though enjoyed by consumers for their abrasion resistance and stretch-free nature, will ruin the cutting edges of a wire cutter or traditional scissors quickly. Terrific for cutting Dandyline®, Fireline® and other high strength fibers used by bead weavers and fisherman. Also a good choice for cutting parachute cord. 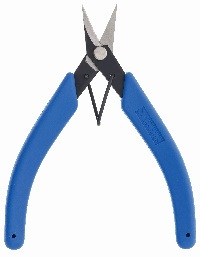 Handles are free of confining finger loops and return spring brings tool back to an open position after each cut. An added benefit -- one of the scissor blades is serrated and acts to prevent the fibers from sliding out of the front of the scissor when cutting. Also available in a non serrated version (Model 9180NS) for cutting sheets of solder or other soft materials.